Wrap-It Heavy-Duty Storage Straps (10 Pack 2S/2M/3L/3XL - Purple) - Hook and Loop Organizer Hanger for Extension Cords, Cables, Rope and More for Garage, Home, Boat, RV, and Camping Organization by Heavy-Duty Wrap-It Storage Strap at Humble Opinion. Hurry! Limited time offer. Offer valid only while supplies last. Wrap-It Heavy-Duty Storage Straps are the best storage solution to organize and store extension cords, cables, hoses, rope, and so much more! 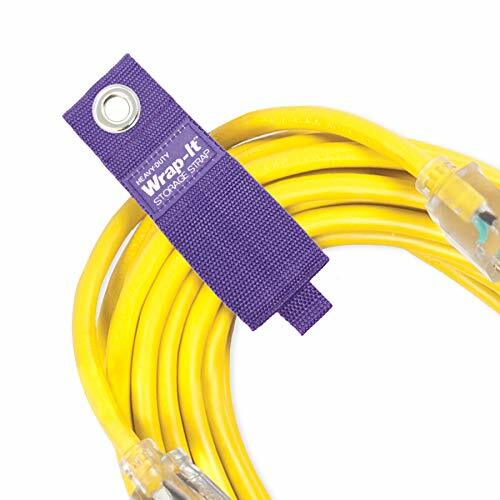 Wrap-It Heavy-Duty Storage Straps are the best storage solution to organize and store extension cords, cables, hoses, rope, and so much more! Durable, reusable, and super strong. Wrap-It Heavy-Duty Storage straps are tough. With heavy-duty nylon, super-strong hook and loop, and a rust-resistant grommet these are built to last. Simply wrap, store and hang: indoor and outdoor extension cords (3 ft, 6 ft, 10 ft, 12 ft, 15 ft, 20 ft, 25 ft, 30 ft, 50 ft, 75 ft, 100 ft), electrical cords, power cords, corded power tools, large appliance cords, amp cords, cables, jumper cables, tie-down straps, ratchet straps, garden and water hoses, pool hoses, vacuum hoses, shop vac hoses, air compressor hoses, pressure washer hoses, festool hoses, rubber hoses, large hoses, rope, ski rope, tow rope, nylon rope, marine and boat rope, chain, Christmas lights, garland, hanging ladders, bikes, and almost anything else you'd need to bundle and hang! Use as a storage and organization solution around the house and yard; in the garage, workshop, warehouse, station, storage shed, or as a pegboard accessory; or in your car, boat, camper or RV. For cord management and as a cord carrier, keeper, tie and holder. The grommet allows you to hang on garage and pegboard hooks. This is the best practical gift for homeowners, DIYers, car, truck, RV, camping, boat enthusiasts, dads, sons, the person that has everything, and Father's Day. A great tool and hardware accessory for construction crews, plumbers, contractors, mechanics, landscapers, electricians, handymen and women. GREAT SOLUTION FOR STORAGE AND ORGANIZATION - Use Wrap-It Heavy-Duty Storage Straps for storage and organization in the garage, house, yard, storage shed, workshop, car, boat or RV. Get organized and stay organized! HANG CORDS, HOSES, ROPE, AND MORE! - Features a metal grommet to make it easy to bundle, organize, and hang extension cords, garden hoses, rope, and so much more in the garage, home, closet, workshop, storage shed, boat, RV, or truck. ENDLESS USES! - Organize, hang, and store indoor or outdoor extension cords, large appliance cords, generator cords, electric cords; corded tools; jumper cables, cables; water and garden hoses, pool hoses, air hoses, vacuum hoses, other large hoses; rope; and so much more! If you have any questions about this product by Heavy-Duty Wrap-It Storage Strap, contact us by completing and submitting the form below. If you are looking for a specif part number, please include it with your message.